An enthusiastic group of swimmers and parents arrived at the Lammas Leisure Centre ready to swim at their best for Portland Swimming Club. Stanley kicked off the evening with a strong second place swim in the 100m IM, and then went on to swim a nail bitingly close race in the 100m butterfly, finishing in first place. Taka swam up an age category in the 50m fly and freestyles races, rising to the challenge with a powerful performance in both. Harrison swam well in the 50m back and breaststroke races, the latter being an incredibly exciting and close finish. Harry, Monty, Saki and Lucy put in strong performances in both the mixed and medley relays, finishing both in first position. Saki also swam with gusto in her individual events, recording her first official time for 50m breaststroke. Lucy swam new PBs in the 50m backstroke and 50m freestyle, knocking 5 seconds off her freestyle time. Fraser put in a strong and enthusiastic performance in the 100m backstroke, recording his first time for this event. Gaby swam to second place in 100m butterfly, achieving a new PB in the process! Freya swam strongly throughout the night and achieved a new PB in the 100m freestyle. Lucian swam a new PB in the 100m freestyle and swam a noteworthy final leg of the open medley relay, helping the team reach second place in this event. Coleby put in a solid effort in all of her relay and individual events, especially shining in the 100m breaststroke. Tarun swam to within a fraction of a second off his PB in the 100m backstroke, as well as performing a strong first leg in the open medley relay. Jonny swam strongly throughout the night, achieving first place in all four of his individual events! Angelina recorded a new PB for 100m IM, finishing the closely contested race in second place. Issy recorded new PBs in both of her individual events – 100m backstroke and 100m freestyle. Bea swam to a photo finish in 50m butterfly and achieved a new PB in 100m IM. 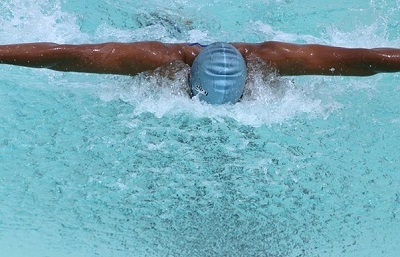 Raj managed to maintain his energy, despite swimming the greatest number of individual and relay events on the night. He even managed to knock over 9 seconds off his PB for 100m IM! Emma swam the 100m breaststroke over 12 seconds faster than her previously recorded PB! Erin recorded two new PBs in her individual events, taking nearly 10 seconds off her 100m backstroke and a whopping 18 seconds off her 100m IM time! The night ended with the excitement of the cannon relay, giving the whole team the chance to work together to achieve a second place finish in this event. Many thanks to the swimmers for working so hard in training to achieve a really good performance on the night; to all the parent helpers, without whom we would not be able to take part, and supporters for their encouragement. A special thanks to Matt for his hard work in training and supporting the swimmers to achieve their potential.